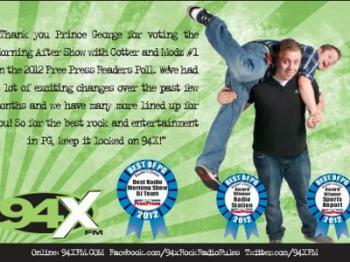 Vista Radio’s Cotter and Modz have been voted the Favourite Morning Show DJ Team in Prince George. “We were very surprised and honoured to be voted #1 in Prince George, as it’s a very competitive market with some amazingly talented, veteran morning teams,” said Kevin Cotter, 94X Program Director and co-host of The Morning After Show. The accolade comes from the 2012 Free Press Readers Poll, which saw thousands of print and online readers surveyed and the votes tallied by an independent auditor. The talented staff at 94X also collected two more plaques, with Sports Director Hartley Miller named #1 Sports Reporter and, under the nose of the newspapers, the #1 Columnist in Prince George. The results of the 2012 Free Press Readers Poll are published in a 40-page volume that’s now been distributed around Prince George.